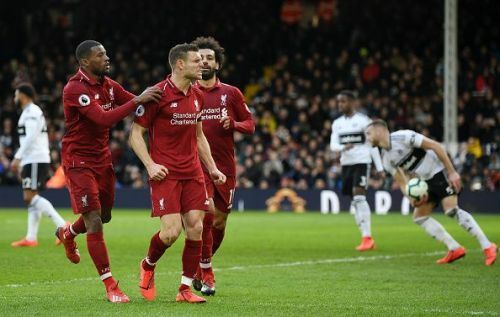 Liverpool are back to the top of the table once again, thanks to the late penalty by James Milner that gave them the 2-1 victory over Fulham last Sunday. James Milner is not the only party to thank here, Liverpool fans should thank their FA Cup exit that gave them a game lead in the Premier League title race. That puts Liverpool on top with Manchester City trying to claw back their position. Now, considering the current UEFA Champions League draw and FA Cup Matchups, we can say that Liverpool are leading the race once again. But why? Liverpool do not have many strong opponents left to face away from home, with only Chelsea and Tottenham Hotspur visiting Anfield in the final run-up. With home advantage expected to play a part, Liverpool should be pretty confident about both the matchups. Jurgen Klopp's men face FC Porto in the UCL quarter-finals stage, which is considered to be the easiest match up for the Reds. This would give them a better state of mind heading into April without worrying much about their UCL's campaign as it seems like Liverpool is only fighting to win the absent Premier League title. On the other hand, Manchester City is still participating in the FA Cup, UEFA Champions League, and still racing for the Premier League title. In aims to win the English treble and the most prestigious club achievement in the world, Manchester City is putting more pressure on his own shoulders. Manchester City's hell will break loose in April, facing Tottenham Hotspurs three times in the same month while having to chase Liverpool for number one spot, making it harder for Pep and his team. With Joe Gomez and Chamberlain returning soon, Liverpool is getting its centre back issue fixed with the pairing of Joe Gomez and Virgil Van Dijk back on the track together. On the the other hand, with Chamberlain coming back into the fold, Liverpool might have just regained a long-lost midfield jewel. It means that the two teams are currently on the same level of competition when we talk about injuries. Both are missing key players that could have made a better approach to scoring goals or blocking some from their own nets. Manchester City is still, after all, the one with fewer matches left to go. But the Sky Blues will need to actually win every single game to put the pressure again upon Liverpool's shoulders. However, a busy April, FA Cup duties, and the strong opposition that stormed in due to the UCL draw might have major implications at the end. Liverpool will return to action on 31st of March to take on Spurs at Anfield, while Manchester City will take on Fulham away from the Etihad on 30th of March.